Sometimes it is useful to have multiple sound sources that operate together. This is called a source array. Before looking at how sound moves away from an array, it is important to remember how sound moves away from a single source. 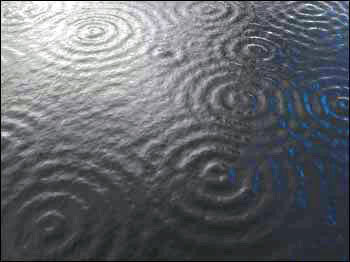 The source produces sound in waves that can be represented as wave fronts. A wave front is a surface consisting of all points on a wave at the same position in a wave cycle. A series of waves can be represented schematically by a series of wave fronts. For example, one can draw the wave fronts corresponding to the crests of each of the succeeding waves. In a source array, each sound source produces sound waves. The combined sound fields from all sources add to create the total sound field. The sound field has two zones: a near field (Fresnel zone) and a far field (Fraunhofer zone). In the near field, the sound field consists of complex interactions among the sound waves created by the individual sources. The complex interactions consist of constructive and destructive interference because the sound waves are not in phase. At a distance that is a function of the size of the array and the wavelength of the sound being produced, there is a transition to the far field. In the far field, the wave fronts from the individual sources add in phase and produce plane wave fronts. Sound field from an individual source (left) and Far field sound field in which the energy from individual sources has combined to create plane wave fronts (right). Credit DOSITS. Sound source arrays can steer the acoustic energy in a specific direction by changing the relative timing of the signals transmitted by the individual sources. This results in sound energy propagating in a preferred direction rather than other directions. Another advantage of a sound source array is that the effective source level in the direction of which the acoustic energy is steered will be greater than the source level of each individual sound source. The effective source level (SL) in the far field is calculated as: SL(array) = SL(individual source) + 20 log (number of sources). 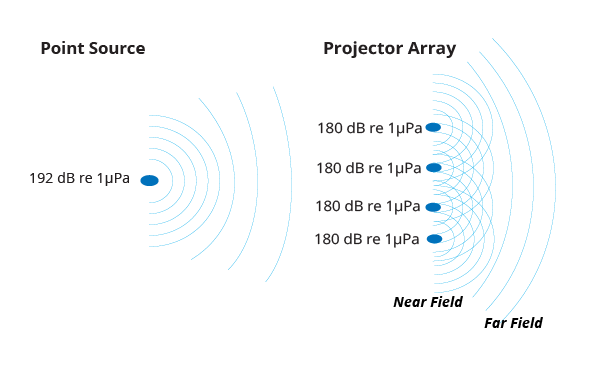 For example, an array of four sources each transmitting at 180 dB re 1 µPa at 1 m, as shown in the image above, would have an effective source level of 192 dB re 1 µPa at 1 m. For more information on this topic, please see Projector Array– in the Technology Gallery.